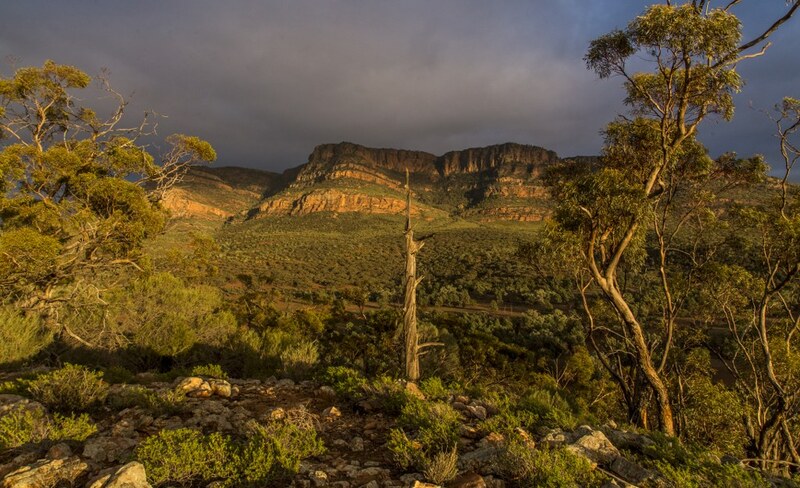 At over 400 km long, the Flinders Ranges is the largest mountain range in South Australia. 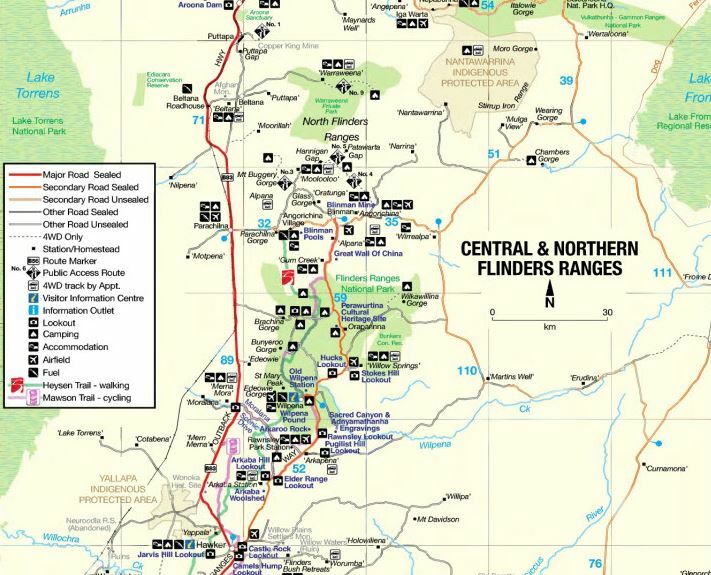 It stretches from near Port Pirie in the south, to Lake Callabonna, north of Arkaroola, in the north. We had heard that the area around Wilpena Pound was quite spectacular, so after finally dragging ourselves away from the Mighty Murray River, we were heading there to see what all the fuss was about. As soon we got a short distance away from the life-giving water of the Murray, the countryside quickly started to dry out. 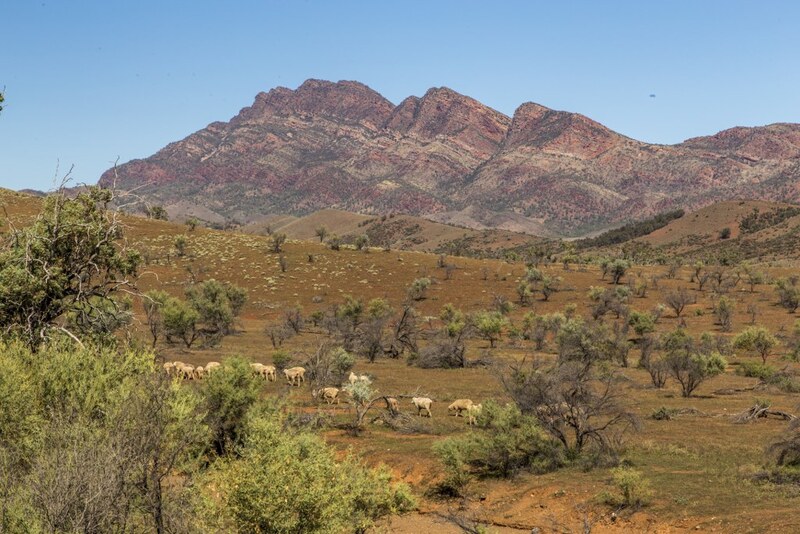 Grape vines, citrus orchards, and River Red Gums gave way to dusty, rocky hills dotted with mobs of merino sheep trying to eke out a living under the blazing sun. It was over 400 km to get there, but we were in no hurry. Stopped off on route at the railway towns of Terowie (for lunch) and Peterborough (to camp). In the late 1800’s, Terowie was a very busy “change of gauge” town (where the rail gauge changed from broad gauge to narrow gauge). 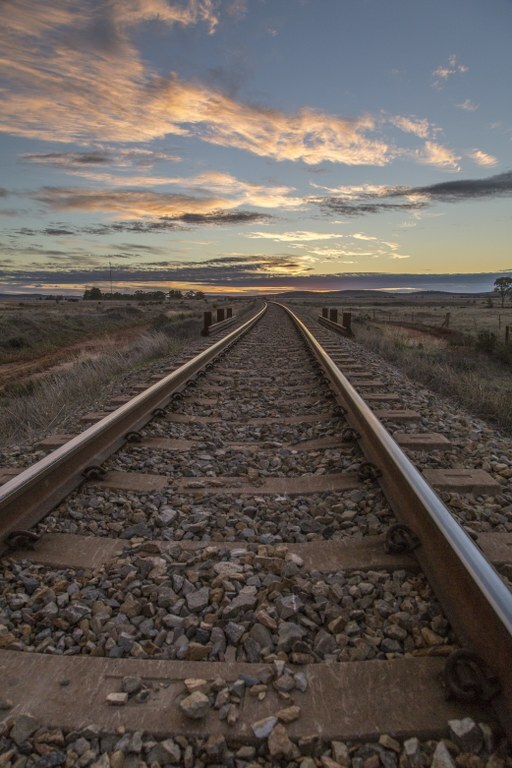 Consequentially, all goods, people and stock had to be moved from one train to another to continue their journey. An expensive, time consuming exercise that happened at many towns around the country until (amazingly) fairly recently. When the train line bypassed the town in the 1970’s it turned, almost overnight, into a ghost town. Terowie’s other claim to fame involves General Douglas MacArthur, the head of allied forces in the Pacific during WWII. In 1942, while changing trains here, he made his famous “I shall return” speech. He never came back to Terowie again. Peterborough is another “trainy” town with a large train museum, which is on the Indian – Pacific line (the twice weekly train that goes from Sydney to Perth). Although we found a nice free camp next to the railway line, our timing was off and we didn’t get to see it. We did, however, get to see (and hear) lots of long, noisy freight trains rumbling though at all hours of the day and night…grrrrrrrr. As we got closer and closer to these beautiful mountains we could start to see the magic with our own eyes, especially as the late afternoon sun reflected on the rocks. Near the entrance to the National Park we noticed a rough dirt track heading off through a dry creek bed towards the spectacular glowing hills. 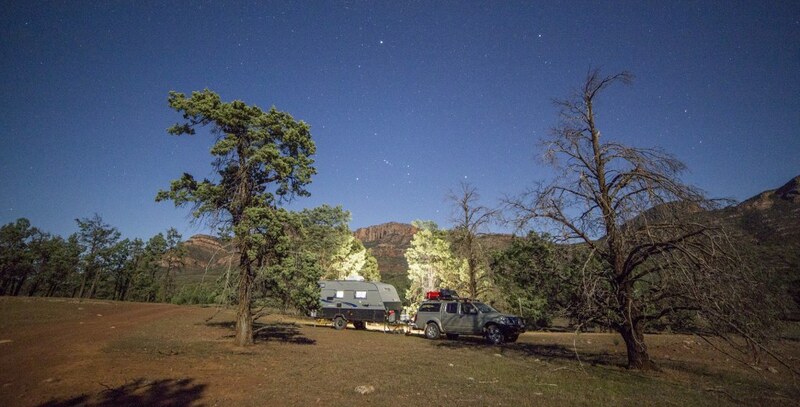 After a brief “reccy” on foot, we found a wonderful campsite…the only question was how to get Leo and The Wombat there in one piece. After some challenging (some would say foolhardy) 4-wheel driving, we arrived at the foot of the glorious mountains. And we had it all to ourselves! We proceeded to settle in here and use it as a base camp to explore the area over the next week. One of the first things to strike you when you visit these 540 million year old mountains is the…well, ancientness of them. 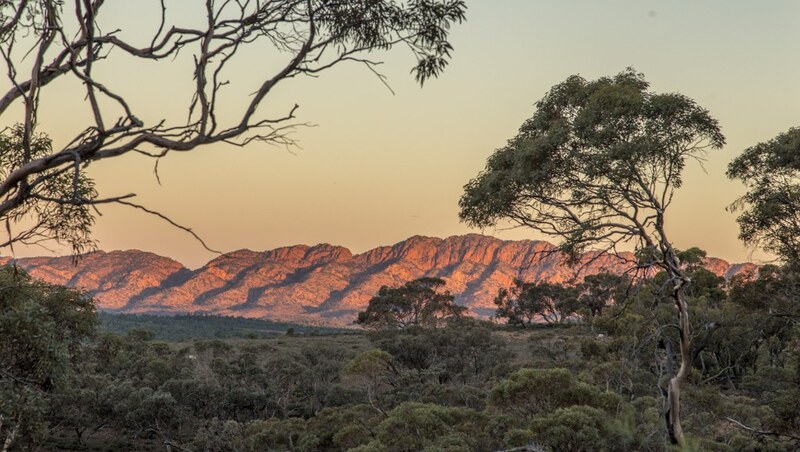 The landscape is summed up perfectly in this quote by Hans Heysen: “the bones of the earth laid bare.” It provides insight through exposure – layers, colours, vastness – an almost intimidating reminder that we are only on this earth for a short time. We may only be here for a short while, but people have called this area home for many thousands of years. 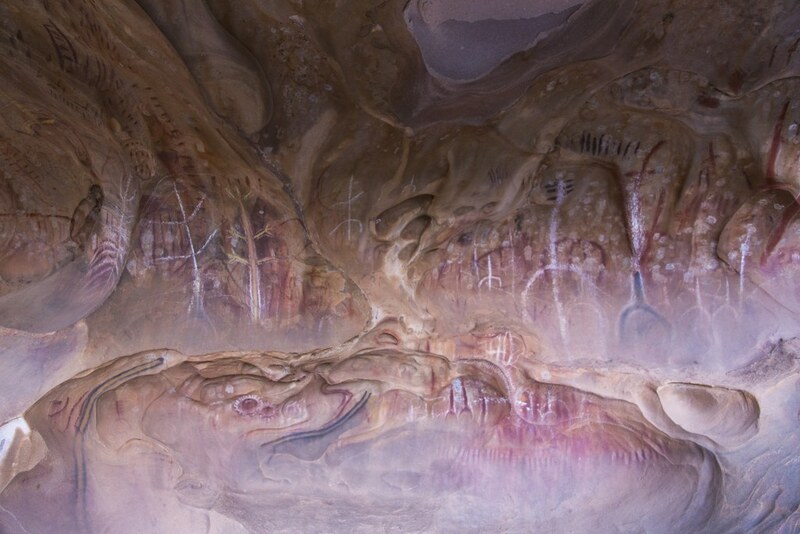 Signs of aboriginal culture abound, including rock art at Arkaroo Rock. 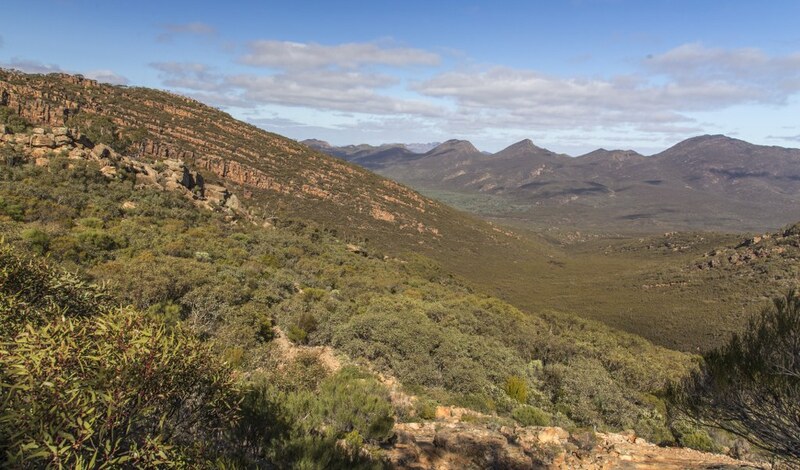 This is a small Aboriginal art site of the Adnymathanha people (“Hills People”) of the Flinders Ranges. We had timed our trip here very well. Not only did we get to have the pleasure of beautiful sunrises and sunsets but it was also full moon time. We were very happy campers indeed! 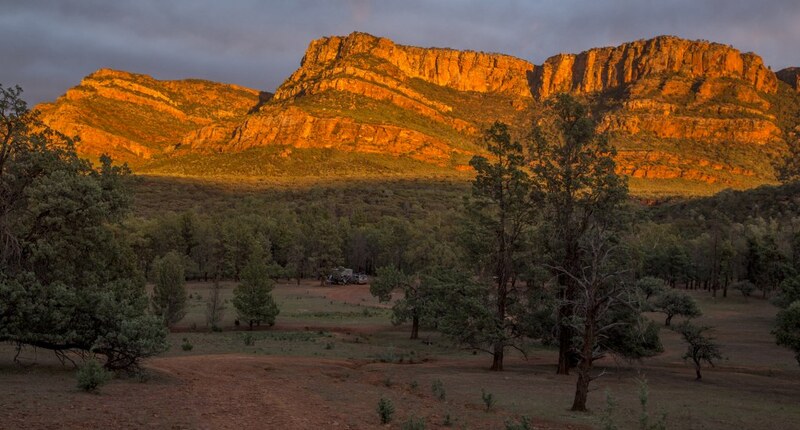 Wilpena Pound is a natural ampitheatre, surrounded by ancient mountain ranges. It is quite spectacular to see but to really appreciate it some serious walking is required. With this in mind, I set off early one morning to climb up to to top of the ridge ringing the “pound,” where you can get a good view of the whole area. It was a long 20 km walk but filled with great vistas and adventures along the way. We could have stayed longer in this lovely area but “The Real Outback” was beckoning. It was time to hit the road again!